Poloniex has completed a major systems upgrade that has enhanced performance across wallet functionality, trade execution speeds and overall latency. Customers are now experiencing a dramatically faster exchange and we wanted to take the time to highlight the benefit of these recent efficiencies. Prior to this upgrade, withdrawals on Poloniex for most currencies could take 5–10 minutes after being confirmed by a particular blockchain. With our recent infrastructure enhancements, confirmed deposits and withdrawals are now typically processing within 1–2 mins. A 2x-5x improvement! These increased speeds apply to all major currencies on Poloniex including but not limited to BTC, STR, EOS, BCHSV, BCHABC, LTC, ETH, XMR and USDC. 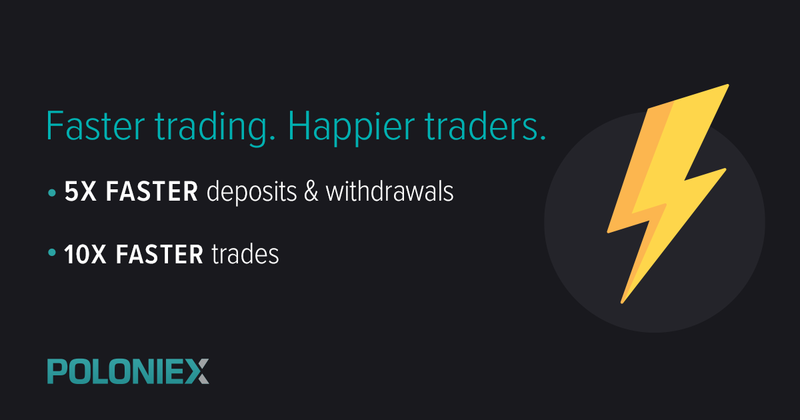 In addition to a dramatic increase in the speed of withdrawals and deposits, the speed in which a trader can post and execute orders has also increased substantially. Increased order speeds stem from a massive improvement in overall latency, which measures the delay in which data is transferred. Prior to this upgrade, Poloniex was averaging 2500 ms (milliseconds) latency per order. As of today, we are averaging 225 ms per order — a 10x improvement, with the groundwork laid to drive that number even lower in the future. Reduced latency will allow our customers to capture market opportunities more rapidly and in a highly predictable way. If those opportunities shift, they will be able to more promptly cancel their orders. While our upgraded infrastructure has made an immediate impact on the speed of the exchange, this is only the beginning! Our newly enhanced infrastructure will also enable us to scale alongside the rapidly evolving crypto-ecosystem with rock solid reliability and lays the foundation for better performance, new features, more improvements, and more support for innovative crypto projects. The success of this system upgrade is the culmination of a lot of hard work from all of our engineers and represents a major milestone for Poloniex. Since being acquired by Circle last year, we’ve now completely revamped Poloniex’s infrastructure, stabilized the platform and reduced existing customer support tickets by nearly 200,000 and are working to get to zero. We’ve also been the first exchange to support pre-fork trading of the BCH hardfork, the first exchange to list Livepeer and FOAM, and one of the first exchanges to support Grin. We’ve also recently simplified our fee structure, reducing trading fees for 99% of customers and have turned our attention to the addition of new features, the return of some old beloved ones, and the curation of more new and exciting crypto projects. With this upgrade behind us, we remain more committed than ever to creating a world-class destination for crypto-traders and enthusiasts around the world. Originally published at blog.circle.com on March 13, 2019.